I’m back home for now. I plan to leave again, eventually. I’m thinking when I am 21. I will have time to get a car, and find myself. Build up some credit and all as well. I will also have time to save some money to get an apartment. On other news, my office area in my bedroom now has a dual monitor, so I am satisfied with that. I’m working on my tattoos. 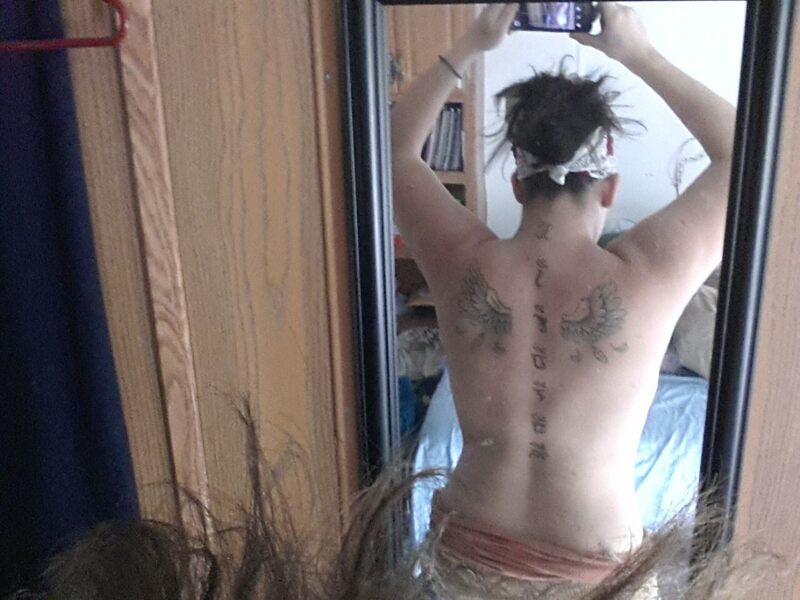 I have the wings and now I have the chakras along my spine. I am going to add more to my back and then that would be it for that. I want some tattoos on my thighs and my arm. Just one. Or maybe both. I have a high pain tolerance, so it’s good. I either want a snake wrapping around each symbol or the colors of the chakra symbols flaring out and around each of them. I want something around my ribs as well. Maybe a small phrase or a cherry blossom tree. But it all has to be redrawn and made my own, by me of course. Like everything that I already have, its all drawn by me.